GLOBEX (open from 23:00 GMT). According to many observations the forex market is adjusting to this market, the quotes differ only by some delta, except for JPY, CHF, and CAD. The futures market closes at 20:00 GMT on PIT and a certain SETT (Close) price is formed. It corresponds with the Close price of the 20:00 GMT price bar on the Forex market. This price is the future trading target. 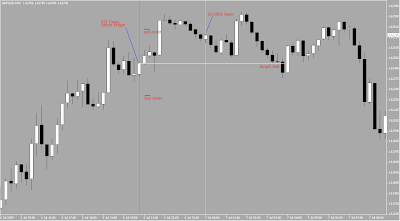 Near this price we can open some buy/sell limit orders with a range of 10-20pt. When the GLOBEX market opens (23:00 GMT) it will be tend to the SETT price. This principle is similar to the Gap Trading, when traders attempt to take advantage of the difference, or "gap," in price between the close of the previous day with the open of the following day. Usually the target will be met within 4-5 hours. The failing percentage is around 10-15%. The best pair for this trading method is GBP/USD. This method does not work with crosses. The picture below show the statistics for GBP/USD for 2001-2005. The blue/green dots represent the successful buy/sell trades when the price met the trading target. 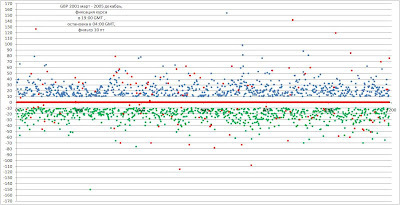 The red dots represent the failed trades when the price did not return to the SETT price. As you can see the best range is between 10-20 pt. I am totally ignorant regarding futures. I see you mention PIT, but when I try to find the PIT charts, I can only find daily stuff (none via mt4). Which futures instrument is the chart based on and where can I get the chart?